No matter what you may think of the Xbox Games With Gold scheme, the promise of free games each and every month, for both Xbox One and Xbox 360 owners, is something which cannot be ignored. Sometimes the masses love the offerings, whilst other months pass by with the community split over what is, and what isn’t, worth the hassle. For May 2017, the Xbox Games With Gold scheme is delivering four more titles for absolutely nothing. But even with the obvious Star Wars and May the 4th relationship, does that mean it’s a decent month? Well yes it does actually, but don’t expect any really big blockbusters to come your way. The month will kick off with Star Wars The Force Unleashed II being stripped of its Xbox 360 price tag. Cleverly running prior to, and then on through, the big Star Wars themed day, the Force Unleashed II most definitely improves the gameplay angle that was found with the first Unleashed, but it’s still a very, very short experience which really struggles to live up to the Star Wars name. Fans of the franchise are obviously going to love it, and you won’t see me dropping too many bad words about a Star Wars based product, but it could, and quite possibly have should, been so much better. For free though, there shouldn’t really be any complaints, but whether you’re still playing it once the proper Star Wars offering comes in LEGO form later in the month, I’m unsure. Thankfully, running alongside The Force Unleashed II is something that is much, much better – Giana Sisters: Twisted Dreams – Director’s Cut. A super fast paced platformer with no less than 33 levels, whether you get drawn in by the smooth flow it brings, or the numerous puzzles which you’ll need to work out, I’m not sure. But one for that is sure is that you’ll no doubt love the visuals and gameplay it brings. The dreamworlds are great to look at, and so if you haven’t played it before, then you’ll like what you find. Just be thankful that it’s not the rubbish Giana Sisters :Dream Runners that we’re being gifted. Come the middle of the month and Xbox 360 gamers see the Star Wars theme continue with the stupidly addictive LEGO Star Wars: The Complete Saga being removed of its price. It may not quite live up to the quality found in the most recent LEGO titles, but the opportunity to play through all of the first six Star Wars films, whilst busting some bricks and taking in the usual LEGO humour is probably too good an opportunity to ignore. You’ll find plenty of characters, a massive amount of content and will no doubt still be playing it months and months down the line. 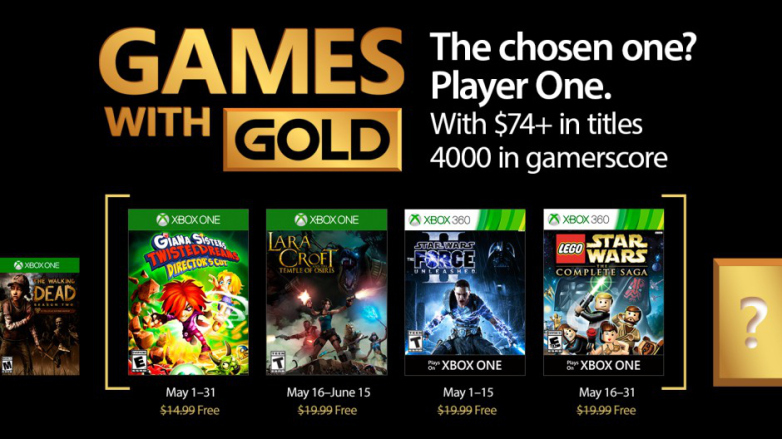 It’s also great for the kids, both big and small, and even though May the 4th would have been long gone by the time you start to get involved, it’s a stunning addition to the Xbox Games With Gold scheme for May 2017. Xbox One owners should also be happy with their free ‘middle of the month’ title and there is no doubt that it is well worth you acquainting yourself with Ms. Lara Croft once more. Lara Croft and the Temple of Osiris is full of puzzles to solve, enemies to defeat and a mean God to put to rest, but it is kinder on the gamer than the slightly frustrating Guardian of Light. Online co-op is most definitely the way to play this game and with it arriving as a freebie you should be finding plenty of others looking to get involved. The whole online setup is pretty annoying, but it’s well worth sticking with it over playing through things as a solo player. Seek the Staff of Osiris and you will discover a rather lovely little tale – albeit one that will be over only a few hours after you start. But hey, it’s free and anything that is powered by Ms. Croft is usually worth a visit. With Xbox One owners being given the chance, as always, to download and play both 360 games thanks to the power of Xbox One backwards compatibility, May of 2017 promises to be a rather interesting month to be an Xbox gamer. The Star Wars theme may take a little while to get going, and it would actually have been nice to see the better of the two Star Wars titles delivered first, but if we must sit and wait before getting involved in a bit of LEGO then so be it. But even without that, the chance to sit down for some gaming sessions with the Giana Sisters or the queen of gaming shouldn’t be ignored. The Xbox Games With Gold scheme is delivering once more.